FILE - U.S. Supreme Court nominee Brett Kavanaugh testifies before a Senate Judiciary Committee confirmation hearing on Capitol Hill in Washington, Sept. 27, 2018. Amid a new investigation of his Supreme Court nominee, U.S. President Donald Trump maintained his support for Judge Brett Kavanaugh on Saturday, saying that "hopefully, at the conclusion, everything will be fine." 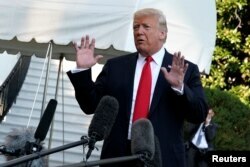 Trump, speaking to reporters on the White House South Lawn prior to his departure for a political rally in nearby West Virginia, noted that the FBI "is all over, talking to everybody," including women who have accused Kavanaugh of sexual misconduct, and "I would expect it's going to turn out very well for the judge." The president also accused opposition Democrats of acting terribly and dishonestly during the Kavanaugh confirmation process. 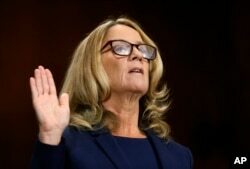 He expressed anger about the leak of Christine Blasey Ford's accusation against Kavanaugh, which she sent to a congresswoman but had previously requested remain confidential. President Donald Trump talks to reporters on the South Lawn of the White House in Washington, before leaving for Wheeling, W.Va., Sept. 29, 2018. Despite what Trump told reporters, news reports indicated the White House might be limiting the scope of the FBI's investigation — such as not permitting scrutiny of the claims of another woman, Julie Swetnick, who has accused Kavanaugh of sexual misconduct at parties while he was a prep school student. "The scope and duration has been set by the Senate," according to a statement by White House spokesman Raj Shah. "The White House is letting FBI agents do what they are trained to do." News reports said the FBI had contacted Deborah Ramirez, the second of Kavanaugh's accusers. The Associated Press reported that Ramirez's lawyer, John Clune, said she had agreed to cooperate with agents. FILE - Christine Blasey Ford is sworn in before the Senate Judiciary Committee, Sept. 27, 2018, on Capitol Hill in Washington. The Judiciary Committee voted Friday to send Kavanaugh's nomination for the Supreme Court to the full Senate after securing a party-line vote in favor of the nod, but Arizona Republican Jeff Flake requested a delay in the floor vote and the additional investigation. "This country is being ripped apart here, and we've got to make sure that we do due diligence," Flake said. Another Republican senator, Lisa Murkowski of Alaska, said Friday that she agreed with Flake's call for additional FBI investigation. 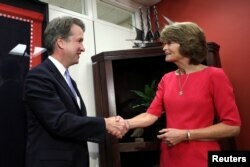 FILE - U.S. Supreme Court nominee Brett Kavanaugh meets with Sen. Lisa Murkowski, R-Alaska, on Capitol Hill in Washington, Aug. 23, 2018. "Throughout this process, I've been interviewed by the FBI, I've done a number of 'background' calls directly with the Senate, and yesterday, I answered questions under oath about every topic the senators and their counsel asked me. I've done everything they have requested and will continue to cooperate," he said. In another development Friday, a high school friend of Kavanaugh, Mark Judge, said he was willing to cooperate with any FBI investigation. Judge is likely to figure prominently in any inquiry by the FBI, because Ford contends he was present when Kavanaugh assaulted her at the suburban Washington party. Judge has denied being at any party with Ford when an attack took place.